Would you believe me if I told you I whipped up the liquid from a can of chickpeas, added some sugar and raspberry powder and made it into cookies? IT’S TRUE!!! And I honestly can’t believe it myself. But these adorable little cookies are basically as close to an angel’s kiss as you might get. They’re airy, they’re light, they melt in your mouth and are made with so few ingredients you likely have them all in your pantry right now. You may have heard of something called aquafaba and it’s the liquid that you typically pour down the drain when you open up that can of chickpeas to make hummus. In 2015 an American software engineer discovered that you could whip the bean brine from chickpeas and it would mimic egg whites in almost every application. And, voila! The internet exploded. Soon there were videos of people making cookies and the previously though impossible golden toasted meringue piped onto vegan pie. I love food and I love how it works. 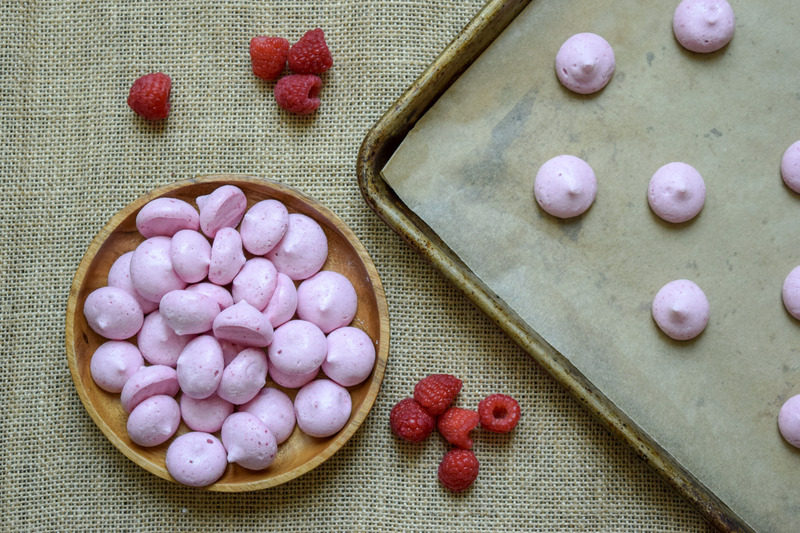 Food science is such a cool thing to explore….and while we still actually don’t know why this aquafaba works the way it does I still think it’s so amazing and fun to play with! I knew I had to share it with you, albeit a little late to the game. So, with Easter just a week away and then graduations and Mother’s Day celebrations around the corner I thought this was the perfect time to post another sweet treat that would work for all occasions! These little pink pillows are my favorite variety, although you can also add blueberry powder, mini chocolate chips, cinnamon and vanilla, almost anything your heart desires to make a fun little treat. And there is literally no way anyone will think they are made from bean water. I dare you to experiment with this! What I can guarantee is that everyone will love them. Preheat oven to 200 degrees. Line 3 baking sheets with parchment paper that fits exactly to the size of the pan. Pour the chickpea liquid into the bowl of a stand mixer and turn on high. Whip 3-4 minutes until soft peaks form. Turn mixer off. Sprinkle the sugar over the top and turn back on and whip for another 2-3 minutes until you have super stiff peaks that hold their shape. Gently fold in the raspberry powder and mix until evenly incorporated. 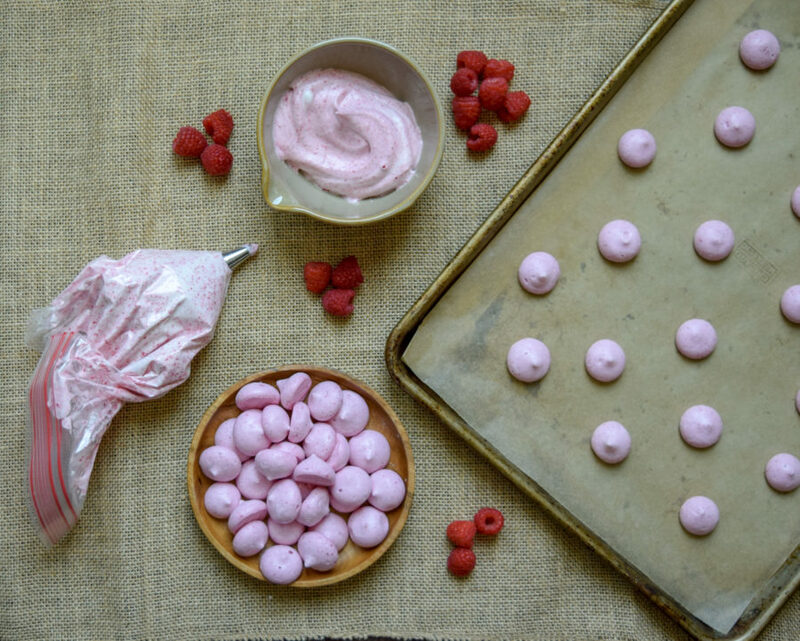 Use a piping bag or a plastic storage bag with the corner snipped to pipe out the meringues into small little clouds, leaving about 1″ between. Bake for 90-120 minutes, depending on your oven. I always bake for 90 minutes then check them, the pans may need to be turned for even baking, and then check every 10 minutes until they are look dry and have not yet browned on the bottom. Cool for 10 minutes then enjoy! 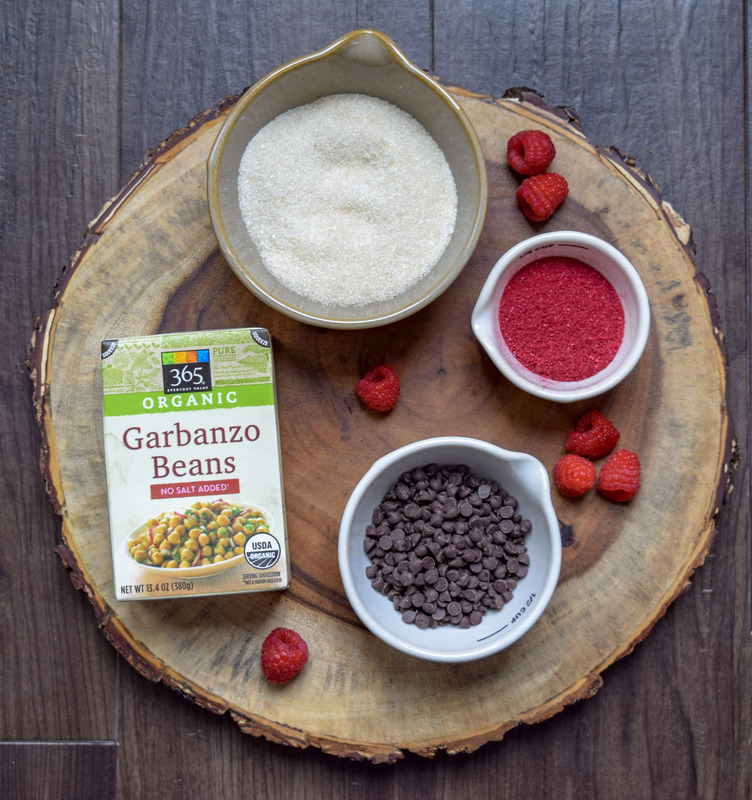 *to make the raspberry powder: pour about 1 cup of freeze dried raspberries into the bowl of a small food processor and turn on until it is a fine powder. Press through a mesh sieve to remove the raspberry seeds.